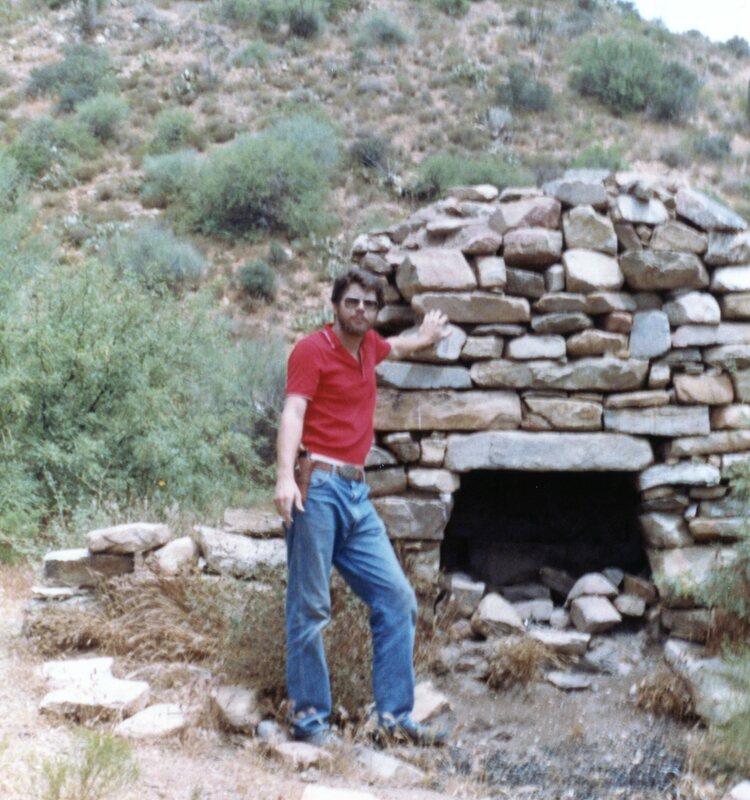 This post finds us back in Central Highlands of AZ, but we continue examining batholiths. 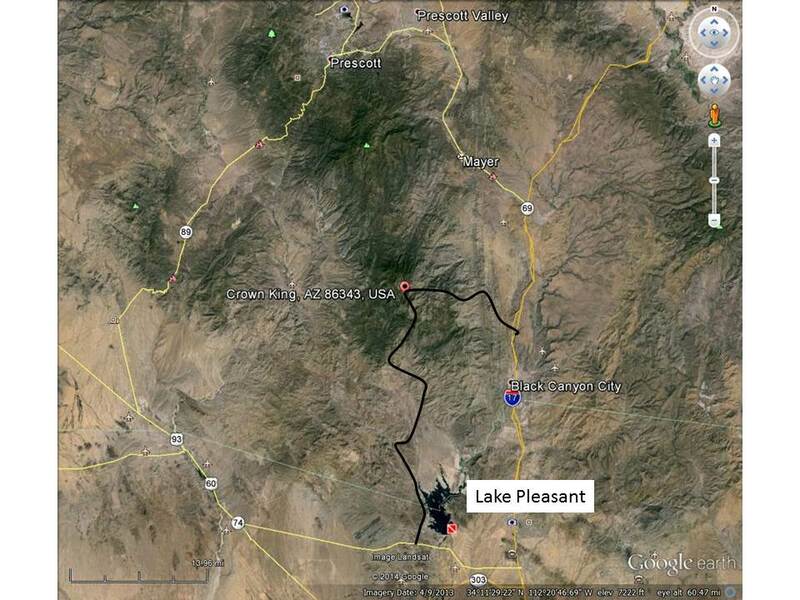 We are going to take another day trip north of Lake Pleasant (see Day Tripping post). This time we are going to traverse a faulted region with the Tertiary volcanics and a pC granitic batholith, as seen in the geologic map of this area. 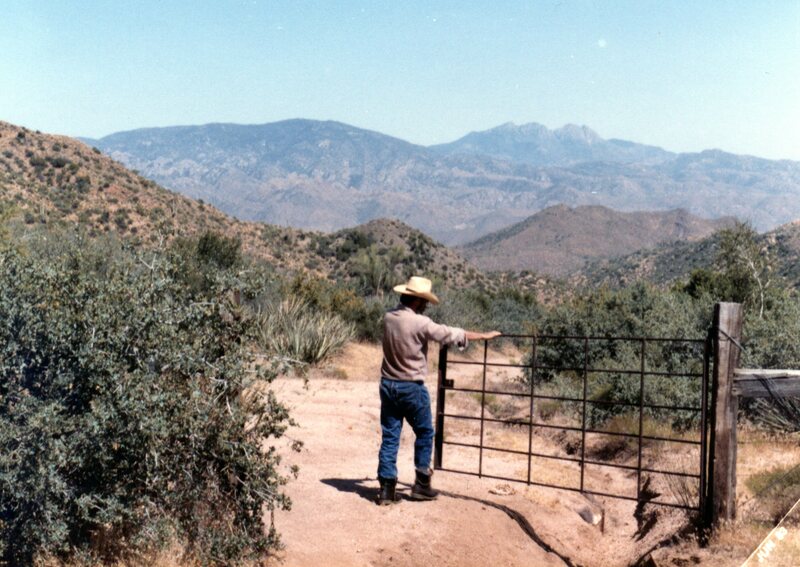 The goal of this trip is a back door to Crown King, up the Agua Fria river drainage basin. This route traverses a complex terrain composed of 1.6 GA (billion years ago) granite and metamorphic rocks, and younger volcanics and sediments. This trip is different from the previous posts because the granite (pluton/batholith) is not entire, but has been broken by a number of geologic faults. These breaks in the Earth’s crust are indicated by heavy lines on a geologic map of this area. 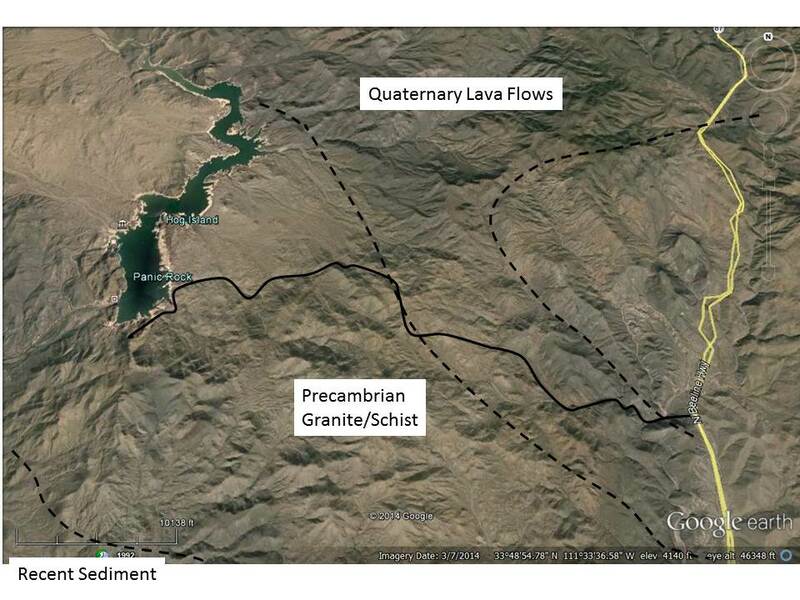 The pC granites (xG, colored gray on the map) are differentiated based on the distribution of elements Na (sodium), Ca (calcium), and K (potassium) within the minerals that construct them. The observed variability is astounding, probably because (1) this is a mining area and there have been many detailed geochemical studies; and (2) this is a batholith that represents many pulses of intrusion between 1.5 and 1.8 GA; that is a period of ~300 million years. This blog isn’t about geology only, however. The ride up all of those faults from <1200 feet to 5800 feet at Crown King is not possible without road building; this brings us to an important concept in offroading. Much of the adventure lies in traversing roads that were built but not maintained. 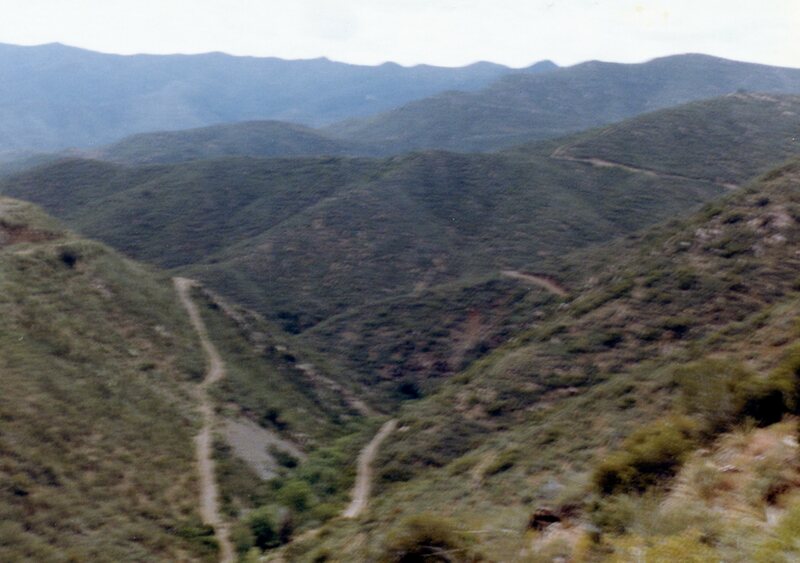 This is one example, as seen in this photo of the switchbacks required to make the climb on unmaintained access trails from Pleasant to Crown King. The need for access and thus roads in underlined by the evidence of abandoned habitation along the way. As with other steep climbs, this one also ends in a high-altitude wonderland of pine and deciduous trees and a lake. To summarize this easy 4×4 day trip; we climbed through Holocene colluvium and river sediments (again) and through a highly faulted and mineralized (mining) zone thru Tertiary volcanics into a pC batholith that is the highest elevation in the region (i.e., Crown KING), where Americans have extracted vast amounts of copper, tin, lead (not much gold) at great effort. Their efforts (and Mother Natures’) allow us to take this fun day trip today! If an orogeny lasts a long time over a great extent of space, plutons overlap and produce batholiths like the Sierra Nevada. This batholith is seen from space as the large white area in this GoogleEarth image. 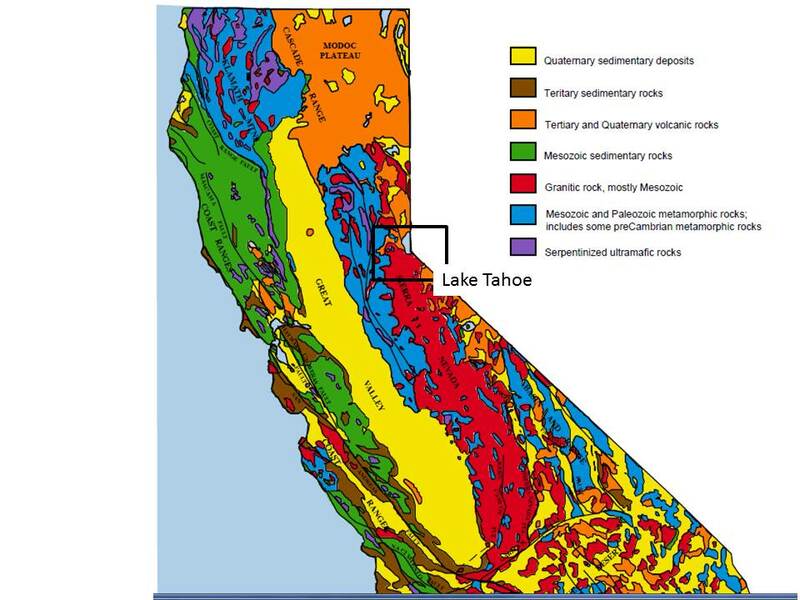 The extent of the batholith is seen in in a geologic map of California. 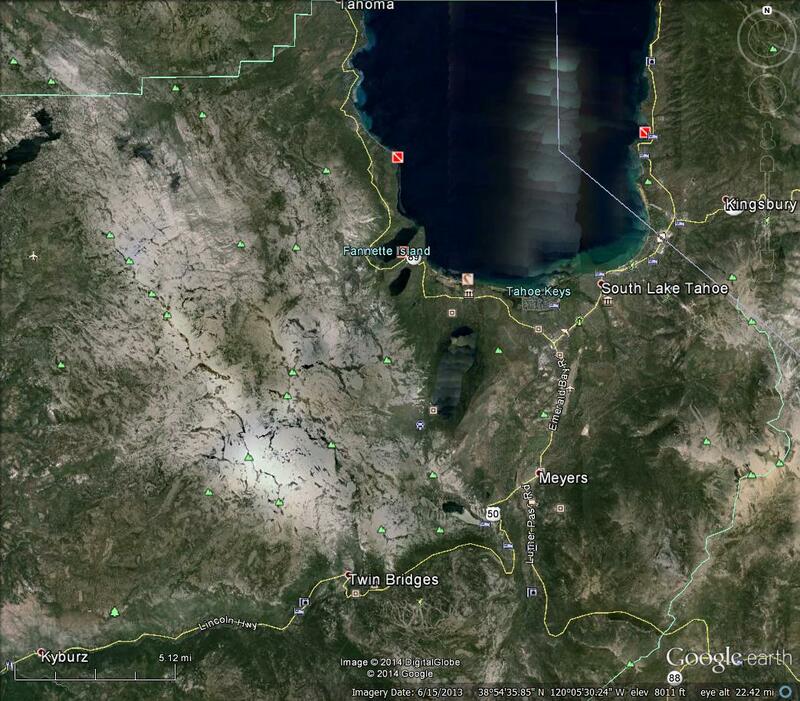 The small rectangle is the approximate location of the famous Rubicon Run from Morristown to L. Tahoe, California. 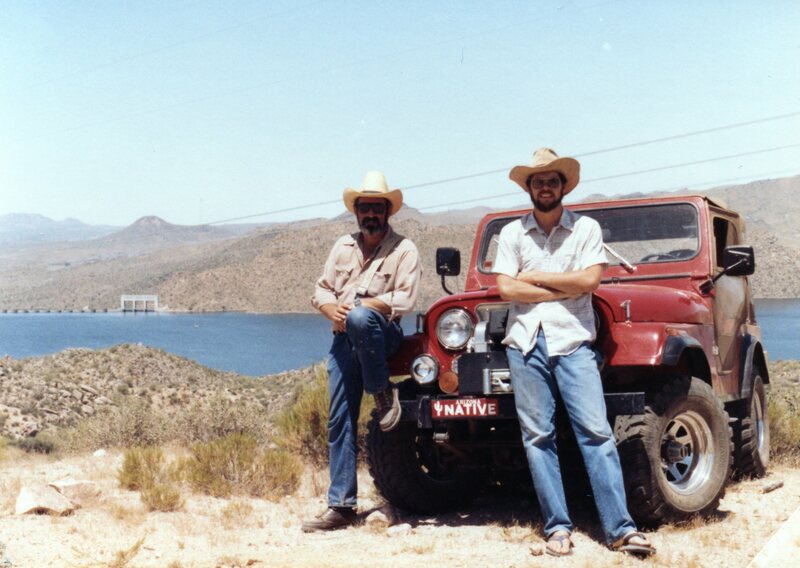 I made this run with some fellow offroaders in 1983. The granites are shown in red, which is a lot bigger than the Harney Granite pluton. It isn’t much higher, however, with peaks at ~8700 feet. These intrusive rocks are also much younger, being intruded over millions of years during the Mesozoic period (~88-210 million). The climb into the Sierra Nevada batholith is thru scenic forests that become primordial on the trail, with streams and many boulders. The trail is difficult to find without a guide over the solid granite mountain. More “gates” that keep large vehicles out finally lead to a glacial valley at the top, where a couple of days are spent camping. After a rest and any needed repairs, we head downhill to the south shore of L. Tahoe and a great meal before heading back to the Basin and Range. I have been avoiding dealing too much with absolute age in these early posts because geology is about looking at the earth and seeing differences in the rocks, soils, plants, and (yes) even weather. What does all of this have to do with a pluton/batholith? Sediments are deposited in more-or-less horizontal form and thus we see younger over older. Intrusive rocks do not obey this rule (Steno’s Law) but they can appear anytime. However, unlike sediments, which are generally not directly datable using a proven scientific method, we can date various unstable radioactive isotopes in igneous rock because they melted and the minerals (mostly) participated in this operation. I am not going to talk about radioactive dating but it allows a quantitative date to be assigned to igneous and metamorphic rocks under most circumstances. Plutons are emplaced from the lower crust and thus Steno’s Law does not apply. When we go off road, we see a LOT of granite, which is an intrusive rock. Granite forms really nice gravel roads and it is quite popular in CO where granite allows a reduced road paving budget. Here is a textbook example of a granite pluton, Mount Rushmore in the Black Hills of S. Dakota. The first image shows how it looks from space and the second shows colored geology over a relief map. The granitic rock is the oval covered with trees because of its higher elevation. This is the Harney Granite (~1.6 billion). It can be seen in some close-up images that show how it melts the rock it is intruded into the surrounding sedimentary rocks at our family web page. 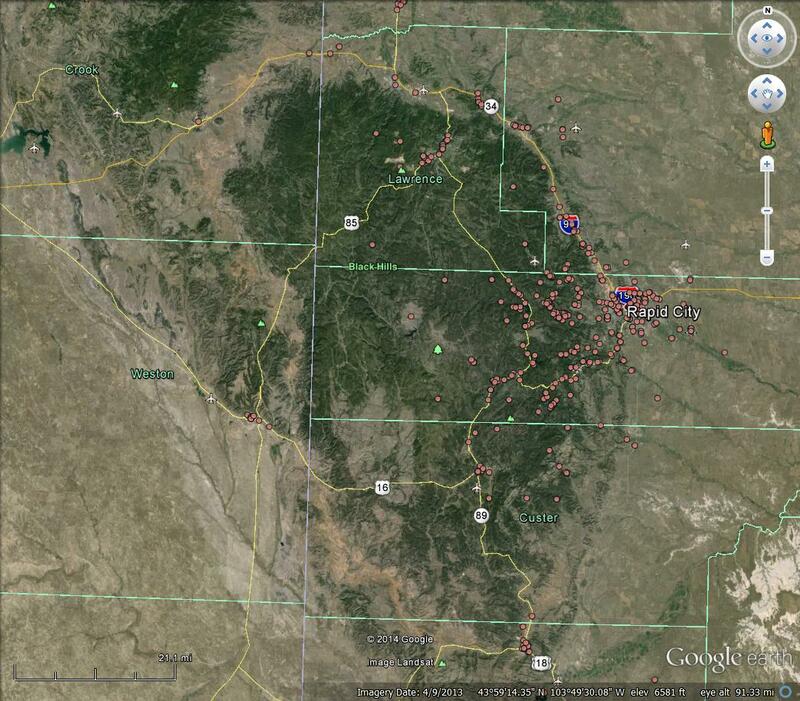 This example is small enough to be viewed in its entirety from Harney Peak. This beautiful pluton has had all of the overlying softer limestone eroded. It is also a great hike to the top at about 7300 feet. 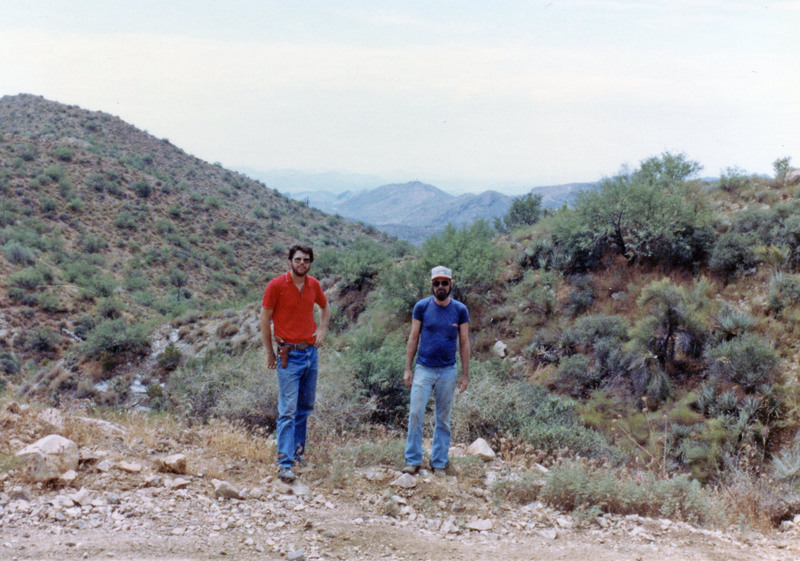 I am developing this reporting method using old pictures from my time as a Geology student at Arizona State University (ASU). A lot of fun and challenging off-roading could be had in a day; I often spent Saturday doing this. 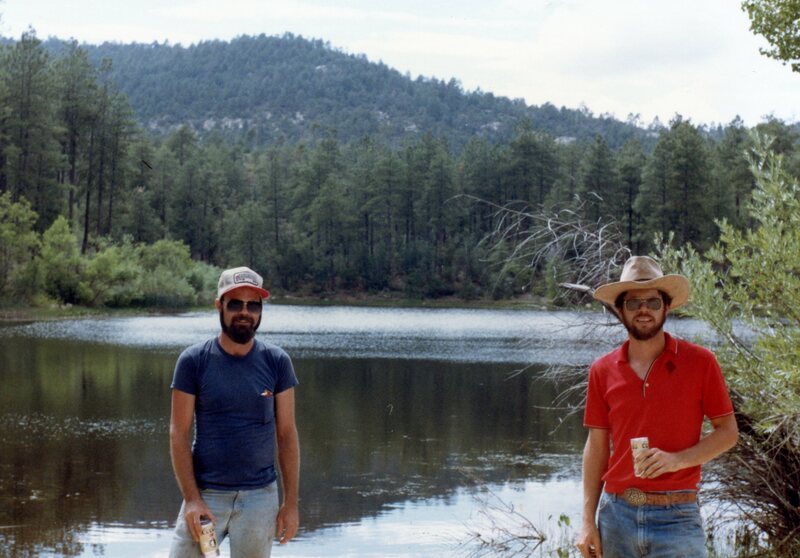 This post is a revisionist day trip blog post, i.e., I don’t remember much (it was 1983) but I have the kind of pictures I still take (incomplete and episodic), so this is kind of what to expect in newer reports. 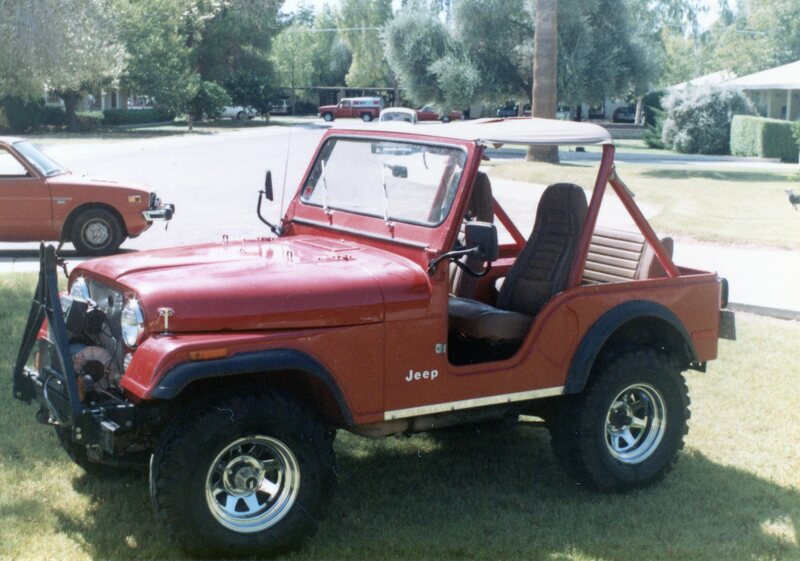 Eventually, I needed a smaller and more capable vehicle than the 6500 lb truck, so I swapped it for a 1980 Jeep CJ5 and dropped 3000 lbs and several feet of length and width. 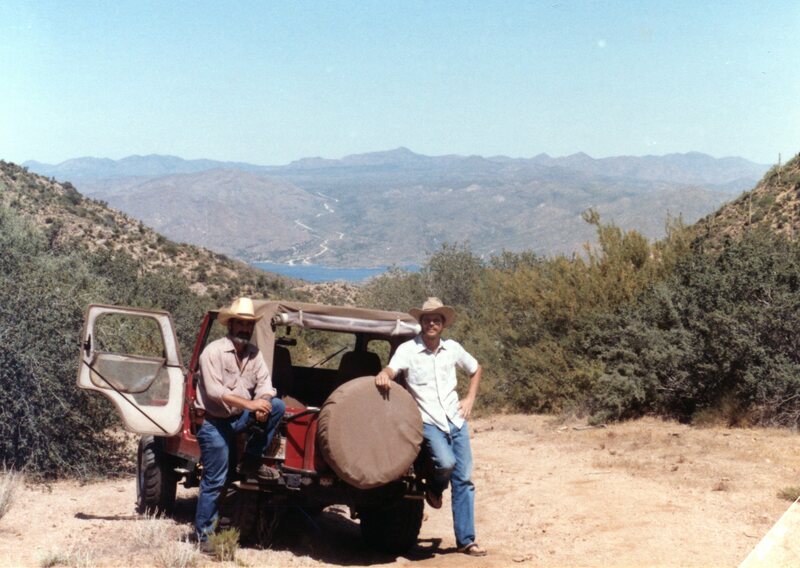 This proved a wise choice, for this report describes a trip with a new friend, who rode with me in the Jeep because his truck couldn’t get through the gate (i.e., a really narrow crevice that even squeezed the Jeep). I met a fellow off-roader (anonymous) on this day, and never saw them again. We met by accident at the gate, which we both hoped led to a new route to Bartlett Reservoir that didn’t involve a road. This Google Earth image shows the region NE of Phx. This image has been annotated to show the overview of the geology on the recent image. We (independently) drove out of Phx on the Beeline Hwy (route 87) and left at a randomly chosen trail (elevation ~2500 feet). We followed (sort of) the solid black line and met somewhere within 1/2 mile of the road where an interesting wash (possibly Log Corral Wash) was blocked by a LARGE (house-size) block of pC metamorphic rock–no picture? We drove up a narrow rocky wash, which suggests that we were travelling thru a very hard rock rather than the recent volcanics, as seen in the geologic map. To be sure, I should have gotten a sample, because, if memory serves, this looked like pC Mazatzal Quartzite (really hard metamorphic rock), which I later studied as a geology student. It is possible that we were in a fault zone where some of the older rocks could be expected to be exposed. After passing thru the narrow point in the wash, we climbed up the ridge in the Quaternary lava flows (< 2.6 million yrs.) to an elevation of ~3000 feet, and came to a real gate (this is open range), which we followed downhill towards the reservoir. We joined up with the service road for the 115 kV power line and continued downhill on this unmaintained trail. The peaks in the background of this image and the previous are remnants of the PC Mazatzal Quartzite, which forms most peaks in the area. The reservoir can be seen in the background. The road on the opposite side of the lake is the main access seen in the satellite image above. We continued through the pC rocks, which are highly faulted in this area and followed the service “road” around the east side of Bartlett Dam, constructed in 1936-1939 (spillway elevation is 1600 feet). The image below is a poor-man’s panorama. I missed the middle of the sequence. Downstream is to the left and the dam is to the right. It turns out that service roads are not really trails or roads; this one ended in a bare exposure of pC rock that could not be climbed without (possibly) modern rock-crawler rigs! We had to backtrack and retrieve the truck anyway. One last photo op at Bartlett Dam. This post hopefully demonstrates why we like to go offroad. This view and great ride can’t be had any other way, except for hiking. I can’t hike (never could) because of my knees so this is my best shot, not to mention it doesn’t require a week to do. The second point is the summary of this trip. We explored the Central Highlands of AZ, which is a transition between the Basin and Range and the CO Plateau in this area. We saw the change in geomorphology and rock type as we passed from young volcanic rocks to pC metamorphic and igneous rocks. We also saw the impact of extensive normal faulting, which produced this juxtaposition of different rocks. One final point: these volcanic rocks look like the ones from the L. Pleasant area (see previous post) but they are millions of years younger. Only radiometric dating methods could have determined this in such a variable geological terrane. Eventually, I could get my own vehicle. I started with a 1968 International Harvester Pickup with 4WD. 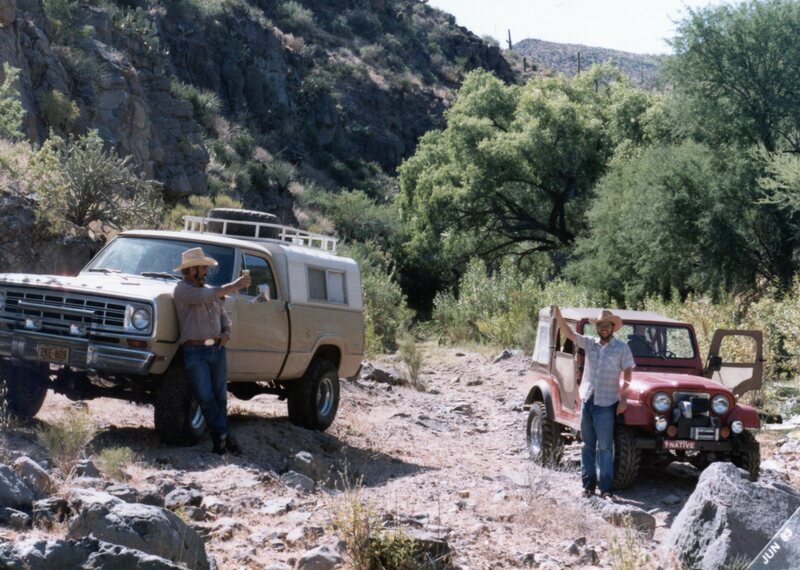 It was okay but I upgraded to a new 1979 Ford F250 and started exploring the Basin and Range with more confidence. 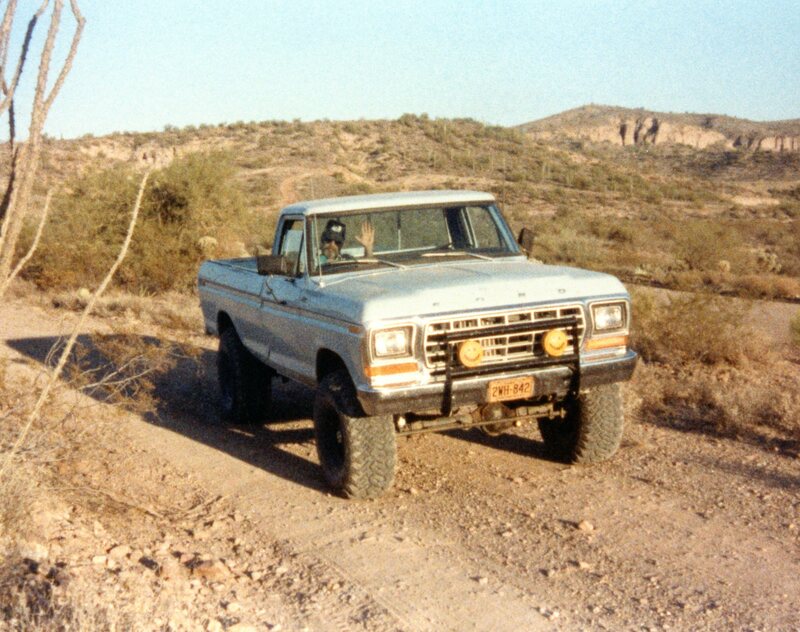 It was very easy to go offroad back then NW of Phx. This post gives a simple example of what this blog is about. 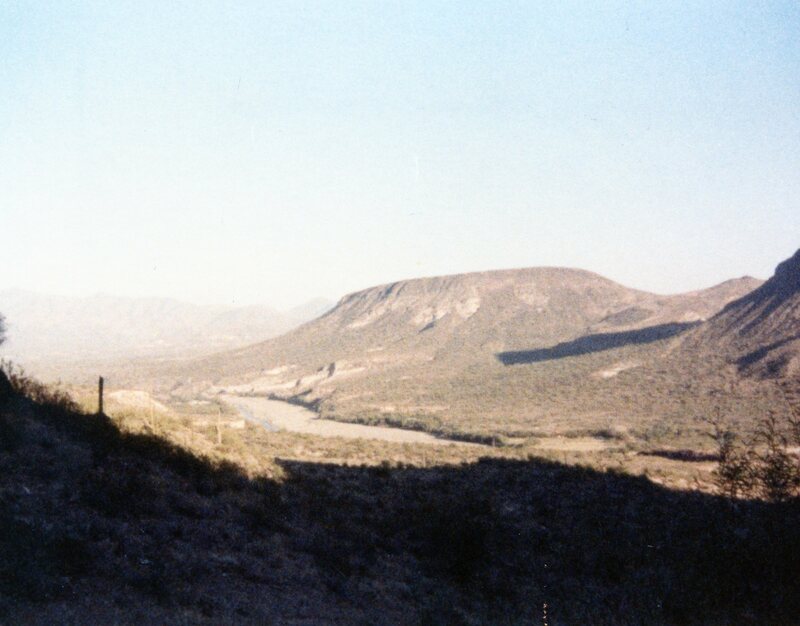 The CAP crosses this image along the south with a couple of bends near the residential area west of 303. L. Pleasant is the body of water to the north. The canal goes through tunnels where it crosses the Hieroglyphic Mts. In order to understand where the photo was taken, and what it shows, we can look at the bedrock plotted over the relief as seen below. This geologic map is coarse and doesn’t show the necessary detail where we were. We can use the Roadside Geology book to see that the Hieroglyphic Mountains are Precambrian schist (metamorphic). 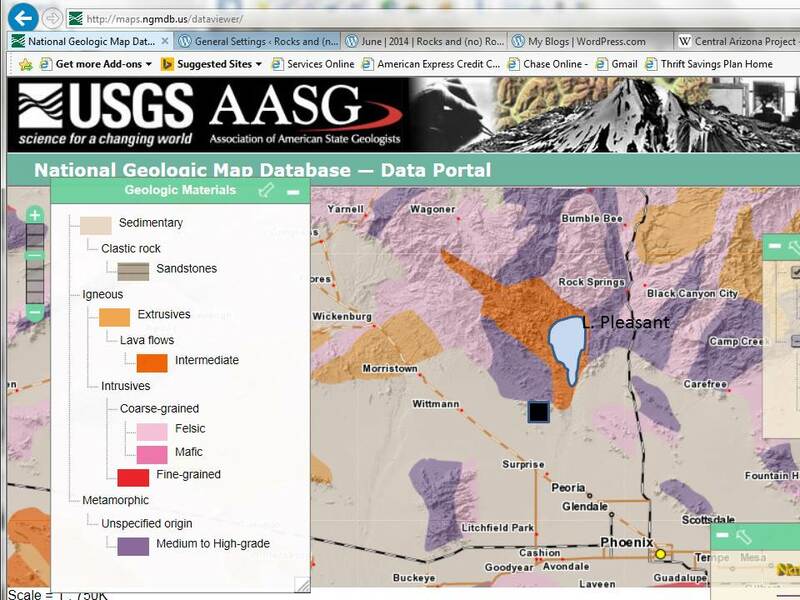 They show up as small ranges within the sediment that fills the Phx Basin. The approximate location of the photo is indicated by a black rectangle in this image. We were driving up a ridge constructed of Precambrian (pC) metamorphic (purple color to the W) rocks. The volcanic rocks (extrusive) on the map are the remnants of a faulted and eroded lava plateau from Mid-Tertiary (~30 Million) mountain building (orogeny) The pC rocks are schists (modified mud stone)that were uplifted from deep in the crust, not necessarily when the volcanics were produced. This image shows one of the many small ridges within the Hieroglyphic Mtns, and a dry river bed that drains the Central Highland terrane west of L. Pleasant. To summarize this easy day trip, we drove north along some recent colluvium (Holocene river/slope deposits) and climbed into a ridge of pC metamorphic rocks overlooking a depression (L. Pleasant) that probably formed along a fault (break in the Earth's crust) during the Basin and Range event. To the west we had a nice view of one of the many ranges that were uplifted many miles to be seen by offroaders like us today. The crux of this post is that >1 billion years ago, there was an ocean/coastline here and sediments were deposited in an environment we can only estimate. These were buried deep to be heated and crushed to form metamorphic rocks (schists). They waited…and then were uplifted. Eventually, volcanics were produced (like Hawaii today) and flowed out over them. Erosion from water wore all of these down to produce the Agua Fria river drainage system and finally, we (people) built a dam and dug a canal across it all. These early posts will be interspersed with any new activities but I am going to follow the introductory theme today by merging geology with geomorphology or physical geography. 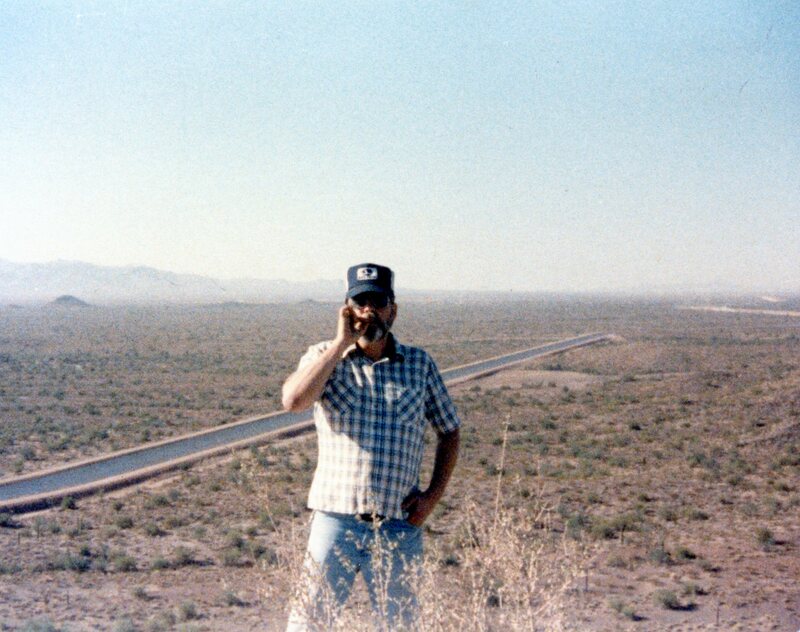 I mentioned travelling around AZ in our cars on roads, which can be quite an experience in the western US. The concept of a terrane is convenient to merge the rocks and geography. 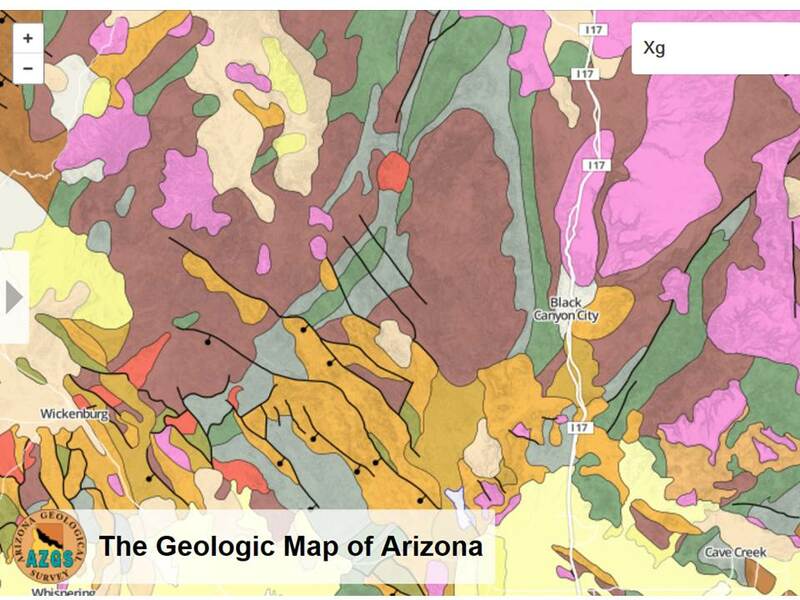 A picture is really worth a thousand words when it comes to geography, as seen in this USGS relief map of AZ. These maps use shading to give the impression of elevation. 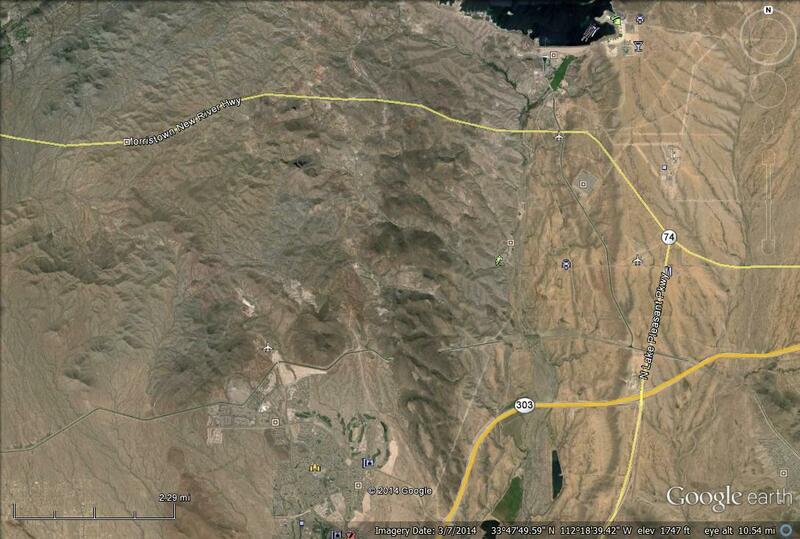 For example, the entire NE part of AZ is the Colorado Plateau at 5000-7000 feet above sea level. Phoenix is at an elevation of ~1100′. These are excellent examples of terranes; The Colorado Plateau and the Basin and Range–PHX is in a basin but it is surrounded by small ranges, like Phx Mtns, South Mtn, White Tank Mtns, etc). The soils within these basins are sandy with clean sand in the river beds (note how many there are in the Phx area, as indicated by blue lines). They can be very fertile because the sediment was carried from the distant mountains (and chemical/physical weathering are strong in rivers); such soils, like those in Maricopa County, i.e., modern Phx, are an ideal combination of sand and clay. 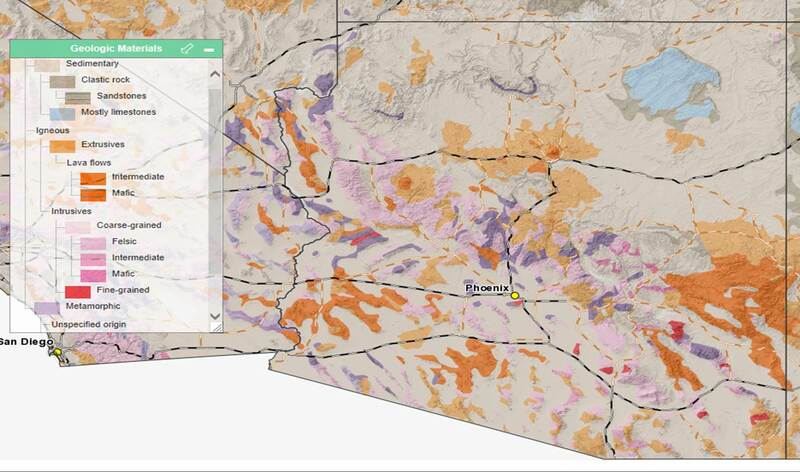 These terranes are also seen in the geologic map of AZ. I need to jump ahead here a little and put my travels into perspective (geological). The earth we mostly deal with consists of soils with different properties, like the hard, dry sandy soil we dug in for arrowheads in SW Colorado. This soil is the eventual product from weathering of rocks by wind and rain, ice, plants and animals, naturally occurring chemicals, and collisions between particles in moving water. These soils are very important to engineers and farmers because we use them for everything we do. However, they do not tell us about the distant past, e.g., the oldest soil in Africa is ~55 million years, but that is really unusual…more water means younger soils. In my travels, I am interested in soils but being a geologist, I really like old rocks! A geologic map shows rocks as if the soil were all removed (i.e. outcrops), like removing the sand from the plaster fossils at a children’s museum. The map below thus shows sedimentary, igneous, and metamorphic rocks but no sand, gravel, etc. 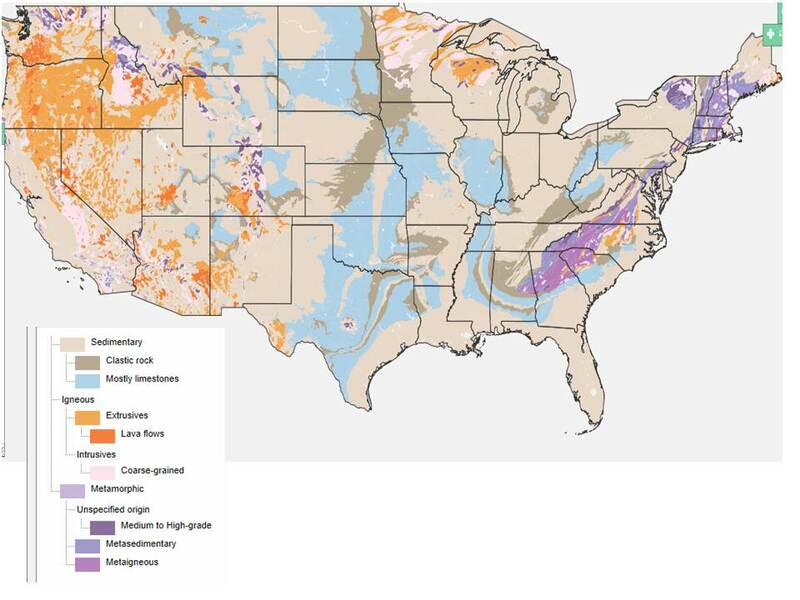 However, the transition from a soil to a rock is gradational and Pleistocene (~2.6 million to 11000 years) rocks are often poorly lithified, as found all over Florida beneath the surficial Holocene (<11000 years)sediments. 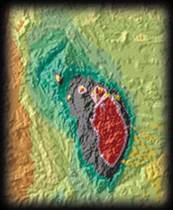 Geologic maps present these at the top of their legends as Recent or Holocene sediments. Of course, there are brand new volcanics in Hawaii and Iceland, and at the sea floor, that are quite hard (lithified); we have to be flexible in dealing with natural materials. This geological map was produced by the USGS. It will be used in this blog to describe the areas I am discussing. 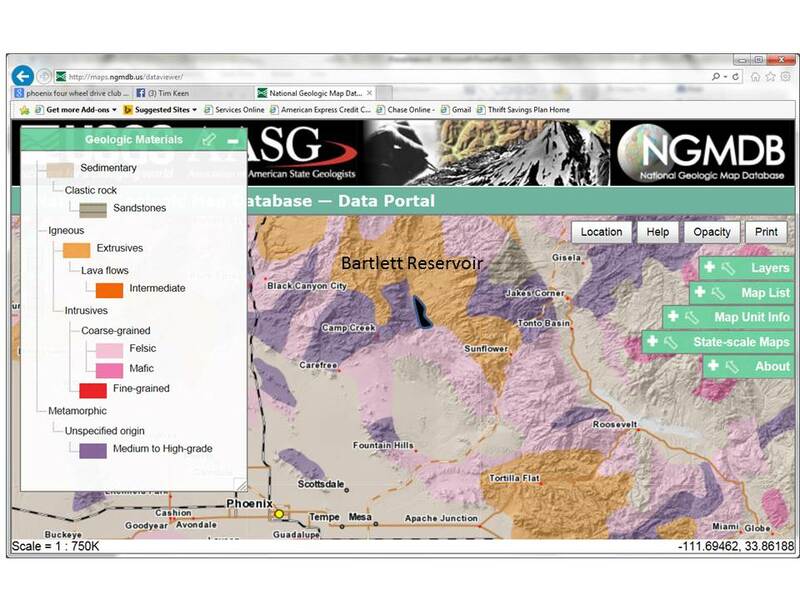 There are many databases but this image shows an easy one to access for non-expert users (http://maps.ngmdb.us/dataviewer/).